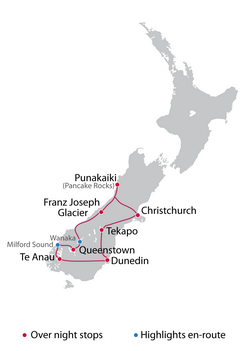 On this 7-Day Southern Highlights motorcycle tour you can do a loop of the Southern Alps, view Mt Cook Aoraki and explore Glacier Country. This self-guided motorcycle tour offers a complete overview of the South Island for those who want to explore New Zealand, but don’t have the time to see everything. Experience Southern hospitality and meet some of the local wildlife too! Spend time in Christchurch exploring New Zealand’s colonial past, get pumped up in Queenstown - the world’s adrenaline capital, and ride some of the most scenic roads that Aotearoa – The Land of the Long White Cloud, has to offer.